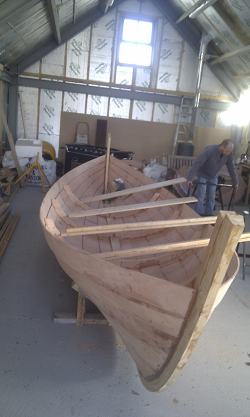 Almost exactly six months after the project started, the Catterline St Ayles skiff was gently rolled over on Sunday. On a glorious sunny day, a crowd of nearly forty people watched or participated in the turning of the hull. The hull was lifted upwards, coming cleanly away from the bed frame. It was then moved sideways and lowered whilst others picked up the bed frame and took it out of the boat shed. The hull was then slowly turned and then gently lowered onto its chocks. With a few gentle tap, the hull frames that had attached themselves to the hull were removed, leaving the hull to be viewed. There were nods of approval from those familiar with Iain Oughtred’s designs. Others expressed surprise at the size of the boat and comments such as “She has lovely curves” came from others. Then tea and cake were served and the moment was enjoyed. Some generous souls bought components of the boat to help funds, which need replenishing. The core boat builders stayed longer, unable to resist the urge to start cleaning up the hull. A few gaps between the planks were spotted that will need filling, but otherwise it looked good. Our youngest and keenest boat builders Jacob and Findlay Ronald are worthy of note. 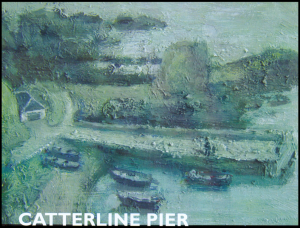 They had persuaded their mother to bring them to the boatshed, and whilst everyone was chatting waiting for the hull turning, they had set to work with planes to continue putting a gentle curve on the thwart beams. For more pictures, see Dottie's Slideshow and our gallery on Facebook. Submitted by stephen on March 12, 2012 - 11:09. The hull will be turned over this coming Sunday (11th March 3pm). Tea and cakes will be served. Any contributions gratefully received. This week, work focused on tidying up the hull. Gary has continued the curve of the stems into the keel. The plane was also run along the side of the keel to make it straight. Meanwhile the hull has been tidied up. Work has also continued on preparing the gunwales. The external gunwales have been taken from a great piece of oak supplied by Ian Buchan and the internal gunwales are from left over timber Rob’s barn/boatbuilding shed. This involves a lot of planing to clean up the wood and reduce it to the correct thickness. Supports are also being built to hold the hull, once it is upright. Overall one of those weeks, where there is not much to show for the effort. But all important in the building of a boat. Submitted by stephen on March 5, 2012 - 17:43. The stems and the hog are now glued in place. This means we will be turning the boat over on Sunday 11 March. We will be celebrating the event and will encourage all of you who have participated the project to come along and mark the event. Tea will be served and hopefully some baking will be there. The Ronald family signed up as boat builders on Sunday and smoothed off the edges on the beams that will support the thwarts. Jacob’s commitment was noted when he turned down a boat builder’s biscuit to keep planing. Over forty people have now worked on the boat. Twenty–seven people have spent an afternoon or more in the boat shed and we had the visit of the P6/7 class. Submitted by stephen on March 4, 2012 - 22:54. After the hectic busyness of Sunday, two turned out on Wednesday morning to a nice quiet relaxing bit of boatbuilding. Outer bow and stem were clamped in place and the fine tuning to make it fit started. And those Spanish lassies were out again! Also number one thwart was planed and sanded, number two was glued up. And time was even found to work some more on the keel and the excess glue was used to fill a few holes! A most enjoyable morning spent boat building! Submitted by stephen on March 4, 2012 - 22:51. "The plane, boss, the plane!" A busy Sunday advancing the project. Planes (including an electric one, which was made to work outside the barn) were hard at work, preparing the stems for gluing, the thwarts and the oars. A decision was taken to not accept the invitation to participate in the Portsoy Traditional Boat Festival, where they are hoping to have 22 St Ayles skiffs (the type of boat we are building) as the builders are not yet confident that the boat will be finished with enough time for the rowing teams to practice. Submitted by stephen on March 4, 2012 - 22:49. SCRA Youth Regatta Series – NEW Dates Added!